One year on and the Bedford is still shut behind builders screens. No idea what's happening now. Planning Application 10/00771/FUL was granted by Lambeth Planning as a delegated decision on 27/04/2010 for "Conversion of upper floors to provide 6 self-contained units, involving the erection of a three-storey rear extension and a rear dormer roof extension with the installation of two rear rooflights. Demolition of part of the boundary wall to create access and exit gate to the rear at lower ground floor level, creation of a new entrance to the residential units to the front elevation and the removal of existing decking to the rear elevation at lower ground floor level and the creation of a cycle store to the rear elevation." No mention of the pub apart from the decking but work has begin. 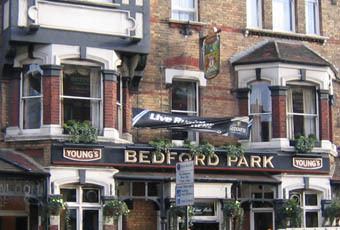 The Bedford appears to have closed and the furniture and carpets downstairs have been removed. According to the land registry, the freehold of the building was sold to Langholm Property Co Limited on 26 January 2009. I believe that the freehold was previously owned by Watney Combe Reid & Company Limited. The lease which was owned by Young's was for the term of 25 years from 29 September 1984. It would appear then that the lease has reverted from Young's to Langholm Property. There have been planning applications this year for converting the upper levels of the building into flats which have been refused by Lambeth Planning. There do not appear to be any restrictive covenants in the freehold which would prevent Langholm Property from leasing the property as a pub. Fortunately where one door closes, another opens, with the re-opening of the White Lion, although as before, sadly with no real ale. I have had some great times in this pub. I think really this place is mostly about music and a good rockin attitude. you get some right characters and the beers not too expensive. Went a few Saturday's ago when my other half's band were playing there. No real ale on (as has been the case the last 3 times we went to gigs there.) Staff seemed not to have much clue about anything but were pleasant enough. Ladies toilets some of the worst I've been too - how the upstairs reaches health and safety standards is beyond me. Went and sat in the garden to avoid the heat and was overjoyed to witness a group of vomiting under 18s off their faces on jagermeister. A place to avoid unless theres a band on you really cannot miss!